Tristan is not an easy place to get to, but is an unforgetable experience for people fortunate enough to make it, either on scheduled ships or on expedition cruises. There is no airport. Trips to the most isolated community in the world need to be well planned. Many would-be visitors have sailed to Tristan, but failed to land. 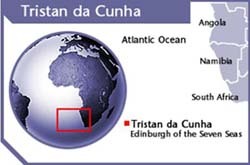 This section seeks to provide potential visitors with the facts to make enquiries to enable them to set foot on Tristan da Cunha, and possibly one of the outlying islands, to enjoy this extra-ordinary place. <>but don't tell the travel agents! There are no package tours for independent travellers, no hotels, no airport, no holiday reps.,no night clubs no restaurants, no jet skis nor safe sea swimming. Visitors are limited due to lack of available shipping berths (only 12 on fishing vessels). 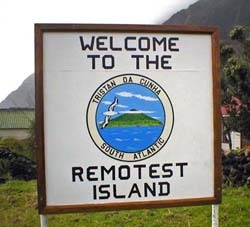 Nevertheless, Tristan da Cunha is one of the world's most sought after destinations for travellers determined to find a special place.....read on, take advice, plan carefully and you can make it! 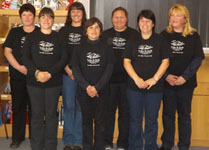 Prepare yourself for the trip of a life time to the extra-ordinary community of Tristan da Cunha.